(英語) Electromagnetic interactions; a rapporteur's summary given at the XIVth International Conference on High Energy Physics at Vienna, September 1968. ハンブルク: Deutsches Elektronen-Synchrotron. (1968). OCLC 9928695. (英語) Hadron and photon production of J particles and the origin of J particles : a rapporteur's summary at the EPS International conference on high-energy physics. パレルモ: 欧州原子核研究機構 [Geneva]. (1975年6月). OCLC 637079059. Brodsky, Stanley J (1965年12月) (英語). Timelike Momenta In Quantum Electrodynamics [量子力学におけるTimelike Momenta]. コロンビア大学; アメリカ原子力委員会（現アメリカ合衆国エネルギー省所管）. http://www.osti.gov/cgi-bin/rd_accomplishments/display_biblio.cgi?id=ACC0377&numPages=18&fp=N. International Conference on High Energy Particle Physics [高エネルギー粒子物理学国際会議]; Ting, S C C (1975年6月23日) (英語). Hadron and Photon Production of J Particles and the Origin of J Particles [ハドロンと光子の生成とJ粒子、J粒子の起源]. イタリア、シチリア州パレルモ: マサチューセッツ工科大学. http://www.osti.gov/cgi-bin/rd_accomplishments/display_biblio.cgi?id=ACC0378&numPages=49&fp=N. (英語) Test of quantum electrodynamics and the study of heavy leptons. Rivista del nuovo cimento, ser. 3. イタリア、ボローニャ: Società Italiana di Fisica. (1982). OCLC 35406700. Zhou, Jinpin (周金品); Ting, S C C; Xiaoming (晓明) (1988) (中国語). 通向J粒子的道路 : 诺贝尔奖金獲得者丁肇中的成功之路. 武漢: 湖北科学技术出版社 [Hubei kexue jishu chubanshe]. OCLC 36076767. Ting, S C C (1990) (英語). Expression of interest to the Superconducting Super Collider Laboratory. 超伝導超大型加速器研究所 [共編]. マサチューセッツ州ケンブリッジ?. OCLC 48918818. ^ a b Ng, Franklin (1995) (英語). 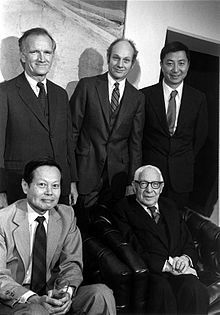 The Asian American encyclopedia. en:Marshall Cavendish. pp. 1, 490. ISBN 978-1-85435-684- 0. https://books.google.com/books?id=B4gYAAAAIAAJ. ^ (英語) Electromagnetic interactions; a rapporteur's summary given at the XIVth International Conference on High Energy Physics at Vienna, September 1968. ハンブルク: Deutsches Elektronen-Synchrotron. (1968). OCLC 9928695. ^ “Experimental Observation of a Heavy Particle J” (英語). en:Physical Review Letters 33 (23): 1404-1406. (1974). Bibcode: 1974PhRvL.3.3.1404A. doi:10.1103 / PhysRevLett.33.1404.